Anne Rooney studied English at Cambridge University. She has written more than 150 books for children and adults, including several on the history of science and medicine. You Wouldn't Want to Live Without Antibiotics! is part of a brand-new science and technology strand within the internationally acclaimed You Wouldn't Want to Be series. 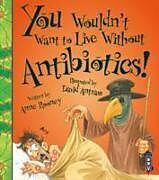 Titre: You Wouldn't Want to Live Without Antibiotics!